Water is an essential element of life. Unfortunately, it is also home to bacteria, parasites, and viruses, which are the leading cause of death globally. Dirty water also contains heavy metals such as lead and chemicals such as fluoride that have their own negative effects in the body. To the benefits of water without predisposing your body to the foregoing problems, make sure that you get water from a good source. Storage should also be clean and designed to prevent contamination as you explore the outdoors or work at home or in your office. Even though this article cannot help you to identify a good source of water, it reviews the10 best filter bottles for storing water. They are durable, spacious, and have efficient water filtration systems that eliminate microorganisms, heavy metals, and chemicals. Do you use standard water bottles to carry water to and from work? Even though most models are stylish and affordable, many individuals question their ability to keep water clean in the long-term. To allay such fears, consider purchasing a well-designed filtered bottle such as Clean Bottle Tritan from a good store. The quality plastic used to make it is durable, 100% BPA-free, and has a stain proof finish that retains its charm over the years. Both ends open for easier cleaning, while its large green-themed body contains up to 25 ounces of water without leaking. Featuring a unique square body, it does not roll around on tables as comparable round models. It is also comfortable to hold and designed to fit most cup holders. Perfect for global traveling, emergency preparedness, and for survival, GRAYL is a premium water purifier with a convenient ultra-light design. Featuring an advanced One Press technology, this bottle filters up to 99.99% of disease-causing bacteria (including E-coli and Hepatitis A) in 15 seconds. It also filters protozoan cysts, particulates such as silt and chemicals such as chlorine that often impair water quality. Apart from its advanced filtration technology, most individuals appreciate its premium design. The blue-themed plastic used to make it, for instance, is durable, BPA-free, and stain-proof. Its ergonomic body is comfortable to hold while its well-designed press drink spout does not require pumping, sucking, or squeezing to work. Known for its line of professional-grade water bottles, CamelBak is an acclaimed brand that benefits outdoor enthusiasts significantly. 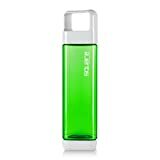 This Groove edition, for instance, is a portable 0.75-litre bottle made of durable BPA-free plastic. Its graphite themed is not only aesthetic but also easy to clean. Its plant-based filtration system is NSF-certified to reduce odor and chlorine from up to 48 gallons of water. CamelBak Groove has a wide screw-on opening that eases filling and cleaning and a lifetime BakTM warranty for defects. KOR Delta is a beautifully designed BPA-free water bottle made of a durable Tritan copolyester that works better than plastic. This odorless material does not impair and or lower the quality of water in any way. Its clear circular design not only fits in most cup holders but also has a spacious interior that contains up to 750mL of water. When camping or hiking, therefore, you do not have to worry about running out of water in the middle of nowhere. KOR Delta is super convenient. Its swiveling cap, for instance, opens wide and stays out of the way to ease drinking. It also has a safety latch that prevents spills, and an exclusive threadless spout that does not irritate lips. 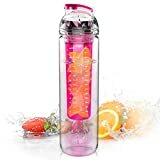 Featuring a BPA-free plastic body with a top-grade full-length infuser, InfuseFruit is an excellent infuser water bottle for men and women. Even though light, its durability is amazing. Color options are diverse, while its spacious 32-ounce interior can satisfy the watering needs of individuals of all cadres. If you are a sports person, for instance, the flavorful water that it produces will meet your needs. Hikers, campers, riders, and runners also enjoy healthy hydration without spending a lot of money. This charcoal black bottle does not sweat as some models do. Its smart design is 100% leak proof, while the satisfaction guarantee offered (100%) attests its quality. According to health experts, a normal adult should consume at least eight glasses of clean water every day. 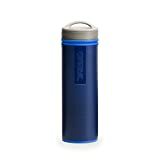 If you enjoy hiking or camping and want to keep your body well hydrated, this 0.6 liter CamelBak Groove water bottle works best. Spacious, for instance, you can travel, hike, or camp longer without running out of water. The aqua-themed plastic used to manufacture it is also travel-worthy because of its durability and spill-proof BPA-free construction. To keep water fresh and irritants free, CamelBak Groove 0.6L has a sustainable plant-based filter (in-built) that cleans up to 48 gallons of water in its lifetime. Do not waste money on one of the poorly designed chemical-laden bottles that often compromise water quality in storage. To keep water fresh and tasty as you commute to school/work or camp outdoors, AVOIN Colorlife works better. Attainable with a built in infuser, you can easily flavor water with some of your favorite fruits. 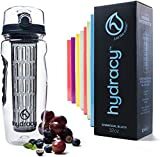 Its BPA-free body is spacious (27 ounces) while its lightweight sports grade design is comfortable to hold and or carry around in bags or pouches. AVOIN Colorlife has a recyclable Eco-friendly design. It is also reusable, carbonated water-friendly, and made of a shutter-proof Tritan plastic that is hand and machine washable. With LifeStraw Go, you get a portable blue-themed water bottle with a durable (1000 liter-capacity) LifeStraw filter. Designed to filter water down to 0.2 microns, this one-stage filter works efficiently. It is also replaceable and effective against debris, microorganisms, and chemicals. This water bottle is 100% leak proof. The premium plastic used in to make it is odorless, BPA-free, and most importantly, designed to surpass the recommended EPA standards. Forget about the yucky drinking water that you consume whilst camping because of the low-grade water bottle in your possession. Popular in top 10 filtered water bottles, CamelBak Chute is a charcoal black one-liter water bottle. BPA-free, its food-grade design does not contaminate nor lower the quality of water. Its angled high-flow spout has an ergonomic drink interface, while its spill-proof design is perfect or traveling. You can place it in the cup holder in your vehicle or a pouch on your backpack without creating a mess. CamelBak Chute has a built-in handle for easier gripping. It also has a tethered screw-on cap that eases filling and refilling and a lifetime guarantee. 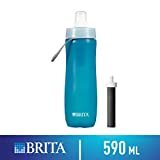 Brita Div of Clorox is a filtered sports-grade water bottle with a dark turquoise body that weighs 20 ounces. Soft-sided, it is durable and fun-to-use. It is also dishwasher-safe (top rack) and made of tasteless BPA-free materials that do not impair the quality of water. Whether you are shopping for a water bottle for use at school or an outdoor camping site, this model will serve you well. In addition to the 2+ servings of water it produces, buyers appreciate its convenient carrying loop (built-in) and angled easy-sip spout.